Goodfellow’s postulation is gaining credence with the latest reported sightings in the Maldives. The plane would have crashed into the ocean after that when it ran out of fuel. They should search the ocean between the Maldives and Madagascar immediately. The time of the sightings matches the time period and distance the plane could have stayed up before it went down. That it crashed is a likelihood and there were no reported landings. There were no reported sightings in Madagascar so it had gone down beforereaching there. 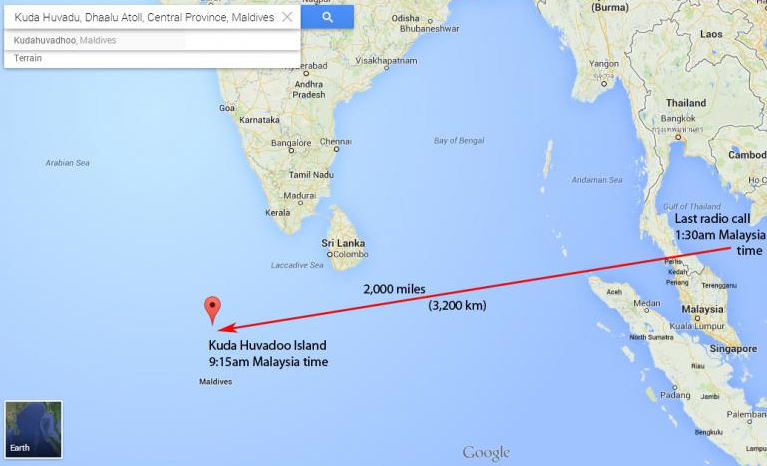 According to a local newspaper, residents of a remote island in the Maldives, Kuda Huvadhoo, spotted a plane at 6:15 a.m. local time on March 8 that could have been the missing Malaysia Airlines 370. Eyewitnesses cited by the paper said they saw “a jumbo jet,” white with red stripes across it, flying low and very loudly. The description of a big airplane in those colors is consistent with the Malaysian Boeing 777.
via Malaysia Airlines Flight Spotted In Maldives? Examining The Latest Theory On MH370.